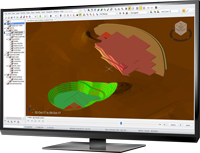 Due for release in October, Deswik 2018.3 provides an integration layer between the Deskwik.Blend optimization engine, the Deswik.LHS haulage and landform engine and associated Deswik.CAD data, enabling users to optimize mining, haulage, stockpiling and processing decisions each period. Up until now, mining engineers have had to make these decisions separately, limiting their ability to model the impacts of dump availability, haulage, and landform on mining decisions. With the new integration, Deswik users are able to run multiple design scenarios and make optimal decisions based on realistic cycle times. Deswik’s Blend-LHS integration is ideal for mine planners seeking to optimize mining and destination decisions to meet site production targets while considering the impacts of landform on cycle times and haulage constraints. “With our new solution, users can model landform and haulage during the blending process using dump and haul road designs created in the integrated CAD package and report haulage physicals from the same process,” Jayne said. For more information on Deswik’s new Blend-LHS integration or to arrange a trial, please contact your local Deswik office.